You meet people with backgrounds and interests that hold your attention. You are never “just another student”; you have a personality and an identity that deserve respect. Quinnipiac celebrates diversity through organizations such as the Black Student Union, the Asian/Pacific Islander Association, and the Latino Cultural Society. Quinnipiac sponsors a study abroad program in Ireland and also sendsstudents to a variety of countries, such as Australia, China, France, and Spain, for a semester of study or summer program. At Quinnipiac, we believe differences enrich every aspect of University life and lead to a heightened sense of community. Wewelcome students from diverse backgrounds; 20% of our student bodyidentify themselves as students of color. 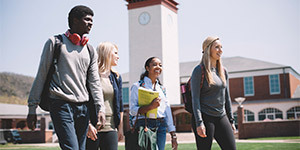 U.S. News & World Report’s“America’s Best Colleges” (2019) places Quinnipiac among the best regional universities in the North. We are also recognized in The Princeton Review’s The Best 382 Colleges andFiske Guide to Colleges 2019. And you are never just another face in the crowd. Our alumni remember the individual attention they received from faculty. Our professors are, of course, experts, researchers, and authors, but their time is spent mostly with their students, in and out of class. We’re on the journey with you to develop your knowledge, skills, and confidence to achieve your goals. In every class, your professor will encourage you to think critically and develop a sense of informed independence. Many courses feature real-world experiences as essential parts of their studies. Quinnipiac cosponsors internships at morethan 1,000 locations,including health care centers, network television stations, Forbes Global 500 businesses, and government offices. The College of Arts and Sciences provides most of the core curriculum courses that give you a solid and broad foundation for your career and future plans, as well as in-depth majors such as Criminal Justice, Political Science, and Psychology. The School of Business Center for Entrepreneurship, the active App Lab, and new collaborative classrooms enhance learning along with internships and international experiences. The School of Engineering majors includeCivil, Industrial, Mechanical, and Software Engineering, plus Computer Science. The School of Communications helps students “tell stories” in all majors using ultra-high-definition 4k and 5k cameras and editing rooms, multimedia and digital design labs, a news innovation center, and all the latest software. The Schools of Health Sciences and Nursing have graduated health professionals in nearly every field who work in hospitals, clinics, corporations, and organizations across the country. The School of Education offersa five-year BA/Master of Arts in Teaching program to students interested in teaching. The innovative program combines education courses witha liberal arts or science major and provides experience in classroom teaching. 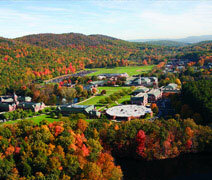 What happens after your years at Quinnipiac? Career advisement in each of the schools is a potent resource that bridges your college experiences with your career expectations. During your Quinnipiac years, your academic advisor will help you select courses to meet graduation requirements and monitor your progress. Our programs and staff focus on job-seeking skills and resources that you’ll need to begin and continue your career. It is an education that works. In a survey of a recent Quinnipiac class taken six months after graduation, about 97% of respondents were either employed or in graduate school full time. The needs of a diverse student bodyare embraced, celebrated, and advanced through the Center for Cultural & Global Engagement and a variety of campus organizations and events. 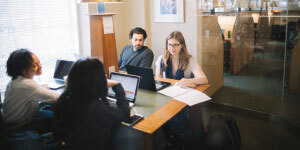 The office is committed to providing services, resources, and initiatives that assist students with a successful transition to, matriculation at, and graduation from the University.